Baker Hughes announced the commercial release of its GaugePro™ Echo on-command digital reamer, the industry’s first bi-directional digital reaming tool. The new reamer provides the reliability, flexibility and operational insight needed to maintain wellbore stability while drilling through challenging formations or constructing lean-profile wells in deep water and other high-cost applications. It also minimizes the rathole, extra hole at the bottom part of the wellbore that is drilled with the bit only, and decreases the additional reaming trips typically required for this section. The GaugePro Echo reamer is the only intelligent reamer on the market that can digitally confirm activation and deactivation, and it can be activated and deactivated as many times as necessary. Activation and deactivation normally require only eight minutes for each cycle. The reamer also can send back information on its oil pressure, oil temperature and vibration in real time for diagnostics and drilling optimization. The GaugePro reamer can be placed anywhere within the bottomhole assembly (BHA), including very near the bit. It can drill and ream in one run, which reduces pipe handling and rig floor time, along with associated health, safety and environmental risks. Triple-redundancy failsafe measures help to ensure that the reamer always trips out of hole, minimizing the risk of costly delays. As many as three independent GaugePro Echo reamers can be placed in one BHA, which is especially valuable for rathole reaming. 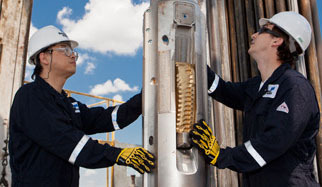 When the reamer is placed near the bit, the traditional second rathole reaming run is no longer necessary, wellbore conditions are improved and running casing is significantly faster. The wellbore can be completed during the first run by drilling and reaming all the way to the last 15 ft (4.6 m) of total depth.